Hanging Rock° is seen here as a solitary mass set off against a blue sky. 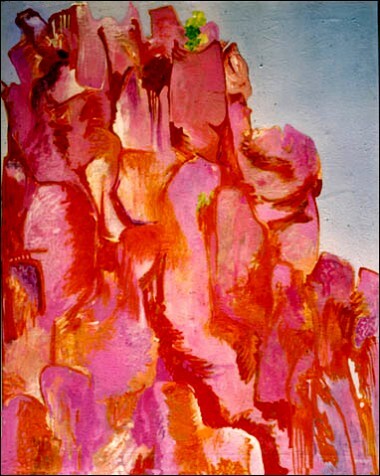 The individual	boulders and rocks which make up the sacred site are boldly drawn in by Matthew Moss in straight simple brushstrokes of orange and red and are hatched in to form masses indicating shadows cast by former volcano . They are indicated by flat washes of fight cobalt violet highlighted mostly towards the upper centre with	white. Elsewhere emphasis is given to the rocks by the use of a deeper cobalt violet brushstroke. A very small amount of foliage is indicated with fight touches of green visible in the centre and top	of the painting. In this canvas the artist's usual preoccupation with high tones is reversed. Instead, the	canvas is largely painted in acrylic while the deeper shadows and the outlines of the rock formations are indicated in an oil based orange. The canvas of Belgian linen has been primed in	white over which has been washed a fight coat of raw siena. This is allowed to come through and add its tone to the overall effect in the area of the rocks. This painting formed part of a series of large canvases which were executed in Ballarat, an ancient gold mining town, and shown in his subsequent Sydney exhibition in the same year. The painting's second showing in Australia was at the artist's Melbourne exhibition. As with the Fern Tree gully waterfall°° the painting is based on an undated drawing, done on the site of the sacred red rock. It is noticeable that there are no trees or shrubs on the rock itself	while the surrounding country is densely grown. This growth, which occupies the lower third of	the pencil drawing disappears completely in the painting, apart from the occasional shrubs in the	crevices of the boulders. While the drawing is of some complexity, it is interpreted as a painting	with much simpler and broader lines. °Hanging Rock, 70 km from Melbourne in Australia, is a distinctive and sombre rock mass. sacred to the Wurundjeri nation. The Rock inspired Joan Lindsay's 1967 novel Picnic at Hanging Rock. In 1975 an eponymous film was produced describing the mysterious disappearance of schoolgirls on a visit to the sacred site.